I had my second baby in November, another boy, and so I didn’t need another baby shower since my older son is only a toddler. I kept all of his clothes and all of the baby gear is still in good condition and not expired. Many second time Moms are foregoing the shower too. 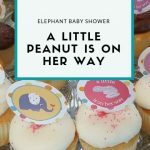 But there’s still a way to celebrate the next little bambino by having a “Sprinkle” instead of the traditional baby shower. So this “Sprinkle” theme got me excited and thinking about what I would have wanted the party to look like had I had one. 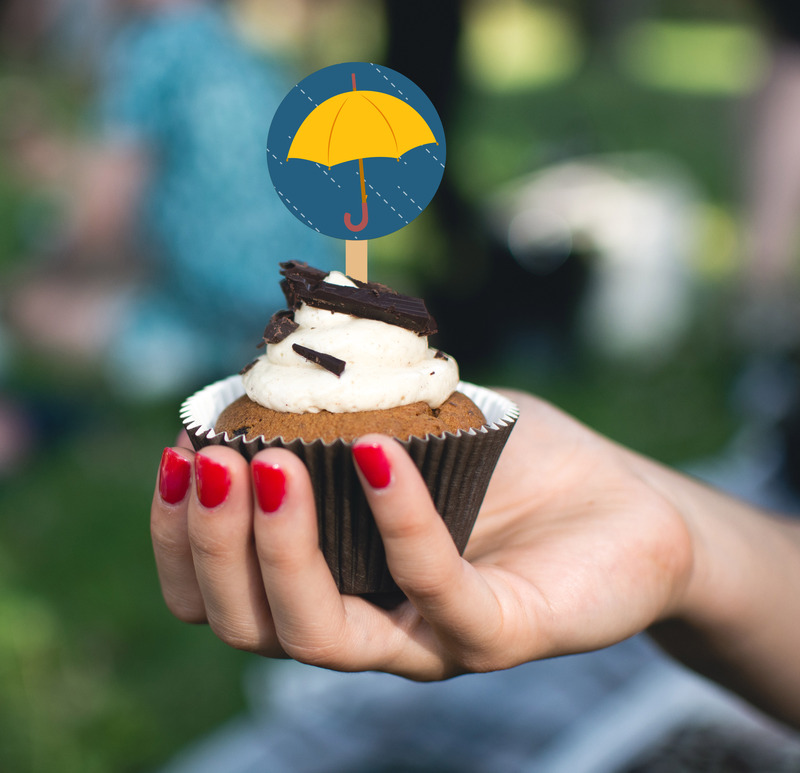 I immediately thought about rain, umbrellas, and fun galoshes jumping into puddles, which got me thinking about bright colors like blue and yellow. And thus, my theme was born. 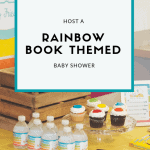 I love throwing parties and one of the best parts of party planning is coming up with a theme and then having it come together throughout the party. 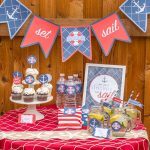 From the invite, to the food, to party decorations, having a consistent theme tie everything together can take the party up a notch. 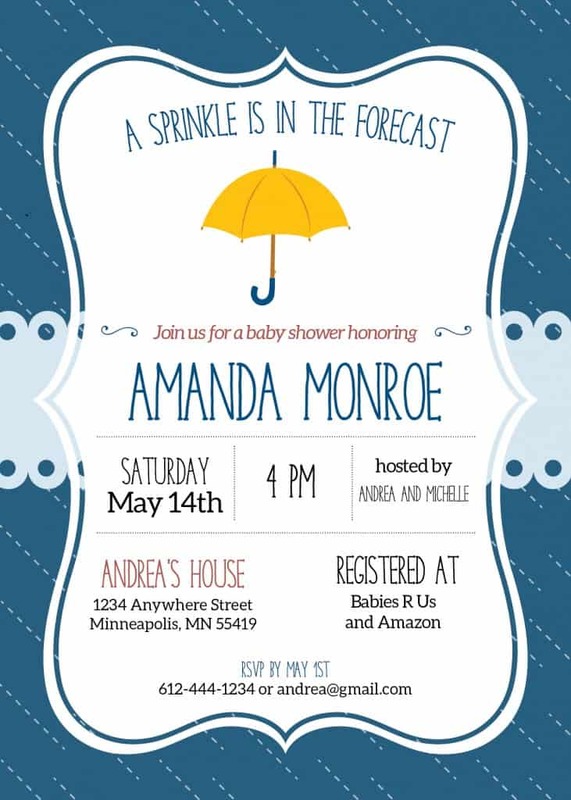 My “Sprinkle is in the Forecast” baby shower theme is perfect for second babies – and first ones too! Choose blue or pink, or go gender neutral with yellow for those “going green”. The Invitation kicks off the excitement for a party and shouldn’t be overlooked. 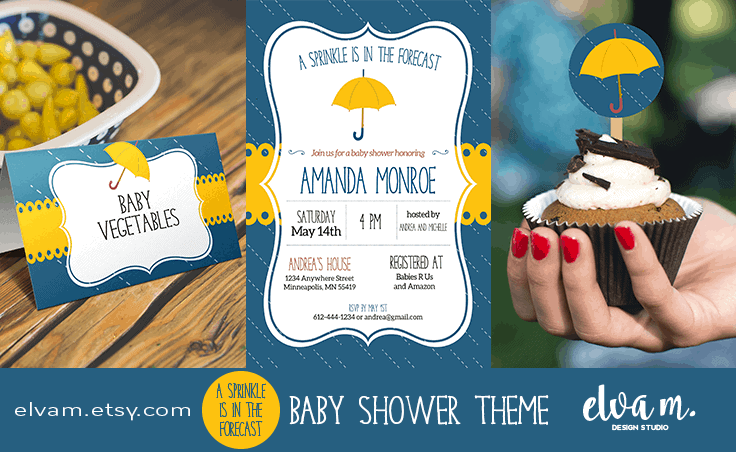 This one combines a fun, blue sideways rain pattern, with a hint of baby’s gender via the ribbon – or choose yellow for a neutral theme. 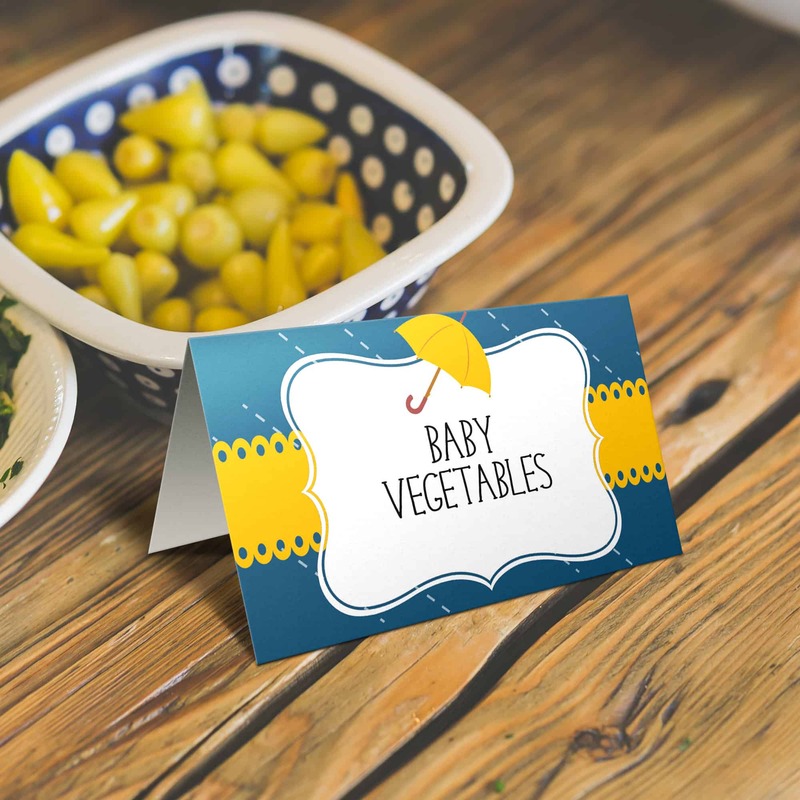 Food Labels or Place Cards are so easy to put together. You simply print on card stock, cut out, write in your food item, and fold. You can even get fancy and add in the food name in Adobe Reader using a font that matches the theme. These not only help guide your guests to what they are nibbling on, but add a great touch to any tablescape. Cupcake Toppers are a simple way to add some party flair in your theme. These are easy – print on card stock, cut out either the circle ones or use a 2″ round punch on the square ones, attach to a toothpick or small popsicle stick. You can use plain card stock as backing or print out a duplicate topper to hide the toothpick if you desire. 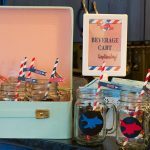 This set of 7 Activities and Games make it easy to keep guests busy and to elevate the energy of the party. Who doesn’t love to test out their Celebrity Baby Name trivia or win a round of Bingo? These cards print two to a page and add some pizzaz to your printed pieces. There you have it! There are so many little touches you can do to tie your theme together.